Just got it assembled and still have a little finish work to do. Thanks for organizing this event. I read a lot about woodworking, but don’t make time often enough to actually DO it. This was a good opportunity to condense it into a weekend (and a little more). Thanks again! The legs and stretchers are kiln dried Red Oak (with some extra kiln drying to “super dry” them). The seat is air-dried Eastern White Pine. My greatest challenges were turning the legs, as I don’t have very much turning experience and kept making things worse by trying to fix mistakes, and the carving of the bowl of the seat, since I don’t really have carving tools. I ended up carving with my turning roughing gouge! Carving the convex parts with a spokeshave was a lot of fun, though, because the wood was so fragrant and cut very nicely. 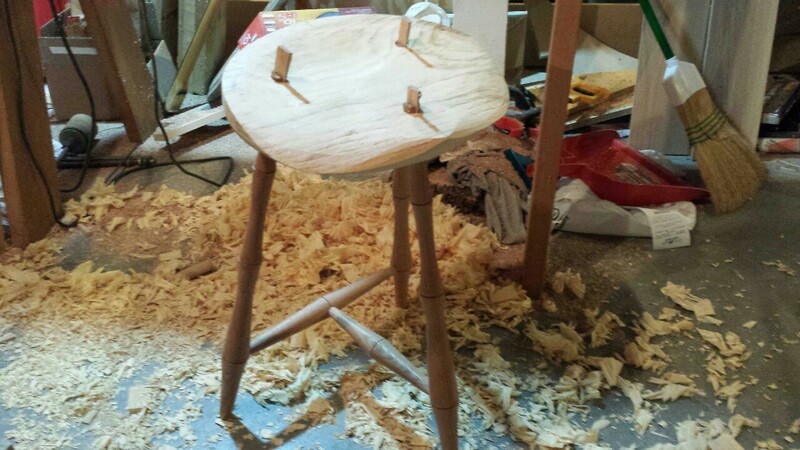 The inspiration for this stool is a Windsor-style rocking chair that I’ve been working on. I was a bit overwhelmed by the techniques needed to build the rocker, so this stool build off was a great opportunity to practice some of the techniques on a low-risk project. I mean, it’s just a shop stool! I’ve heard musings about a bench build off. It seems like that would need to have a longer timeline, but I would be excited about building a bench and following along as a lot of other people do too.